The weekend’s marquee match-up features two of America’s best teams, biggest programs, and most prolific coaches. The plethora of NBA talent on the floor and players with college accolades to their name may not be matched the rest of the season by any game, in or out of conference play. Kentucky takes a break from their buzzsaw through the SEC to face Kansas, in a game that could decide who receives a number one seed. The lineups on each side are stacked with exciting names, but they become even more intriguing when boiled down to the match-ups we’ll see tomorrow. Who has the advantage? Let’s break down the four biggest factors in play one by one. Fox has had so much success this season knifing into defenses to finish at the rim or kick to open teammates. He’s attempted a team leading 117 field goals at the rim, making 70% of those shots. For a 6’4 point guard to led his team in that stat and do so that efficiently, as a freshman, is nothing short of spectacular. To date, few have succeeded in staying in front of Fox. Kansas counters with Frank Mason, a senior with the physical tools and the savvy to give Fox fits tomorrow. Mason has faced a litany of all-star point guards in his three years as a starter in Lawrence. He will test Fox by playing physically for 94 feet and by making Fox give constant effort on both ends. Whichever of these point guards commits fewer turnovers, or can cause more live-ball turnovers on defense leading to fast break points, puts his team in position to steal a win. The other guard match-up should be just as intriguing. Monk has been absolutely deadly this season, with only two major conference players attempting more threes and making them at the same or a higher percentage. Over his last 1o games, he’s averaging more than 24 points per game. In his freshman season, the college game has come easily, because Monk is so naturally talented, but as he’s learned how to move without the ball and hunt for his shot more effectively, Monk has become one of John Calipari’s most potent weapons in his time at Kentucky. Again, this Kentucky freshman will face a Kansas upper classman with bona fide defensive chops. Devonte Graham spent most of last season draped over players like Buddy Hield (5 for 15 from the field at home vs. Kansas) and Bryce Alford (1 for 6 from the field vs. Kansas). Graham enters this game with one objective: stick to Monk all evening long. There are a lot of ways for this game to play out, but Kansas can not win if Monk gets hot. The Kansas bigs, though veterans, have been shaky all season long. On both ends of the floor, and on the glass and in transition for that matter, Landen Lucas and Carlton Bragg have left Bill Self searching for answers. He’s been forced to play Josh Jackson almost exclusively at power forward, which has worked in spurts but leaves the Jayhawks vulnerable against bigger lineups. Enter Bam Adebayo, a monster child who’s heart lives to dunk basketballs. For Kentucky to create and keep a lead, Adebayo will need to dominate the boards, like he has all season. Bam’s offensive rebound rate is over 11% and hes converting over three-quarters of his putbacks. That explains how he leads the SEC in true shooting and effective field goal percentages. Making matters even worse for the Jayhawks, Bragg, who has been on the court 35% of the time for Kansas, has been suspended indefinitely for a domestic violence incident as of Thursday night. Bam Adebayo is licking his chops. Kentucky will likely guard Jackson with some combination of Wenyen Gabriel and Derek Willis, neither an elite defender. 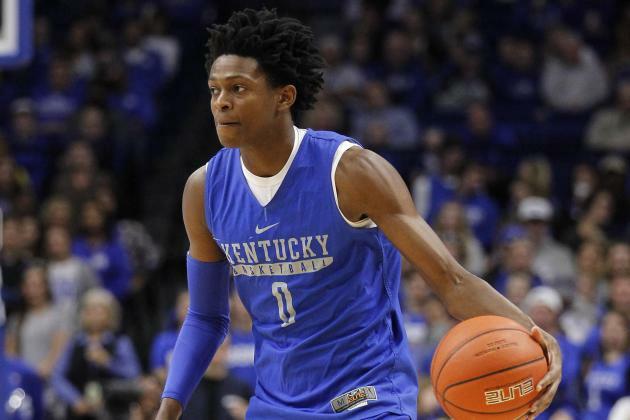 Jackson can force Kentucky’s hand by beating them off the dribble consistently, leading Calipari to find an answer elsewhere, via a more drastic defensive or lineup change. If Jackson is giving Kentucky trouble, don’t be surprised to see Isaiah Briscoe cover him for periods. He’d give up a significant height difference, but brings a more complete defensive toolbox to the table.